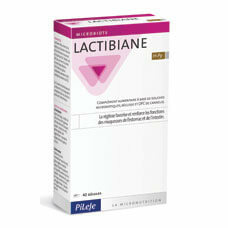 Lactibiane H-Py contains liquorice, which assists and improves the function of gastric and intestinal mucosal membranes. Microbiotic strains in Lactibiane H-Py selectively bred by PiLeJe are registered in the National Collection of Microorganism Cultures (CNCM). Whom to contact for advice? Swallow 1 white capsule and 2 brown capsules daily with a glass of water, with meals. Duration of use: 2 weeks, recurrently. Usage precautions: not recommended for persons with arterial hypertension or kidney failure. Due to the presence of liquorice, do not use for more than 6 weeks without doctor’s recommendation. This food supplement is not a substitute for diverse balanced nutrition and a healthy lifestyle. Use-by date and batch number are indicated on the bottom of the carton. Bulking agent: corn starch and glyceryl mono-, di- and tribehenate, lactic ferments (carrier: corn starch), capsule of plant origin, anticaking agents: magnesium stearate and silica. 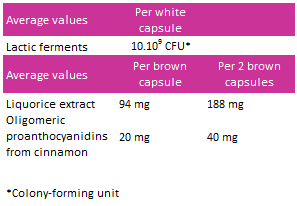 Cinnamomum cassia cinnamon extract (bark), capsule of plant origin, Glycyrrhiza glabra and/or Glycyrrhiza uralensis liquorice extract (roots) (carrier: maltodextrin), bulking agent: corn starch, anticaking agents: magnesium stearate and silica.